Ladies and Gentlemen, welcome to the 100th post giveaway at Money Is The Root. This is a more profound contest for me than the previous ones, since this will officially be my 100th post on the blog! It’s been an exciting 6 months, and I want to thank all of you for consistently visiting and contributing to my blog. 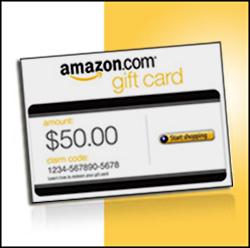 The giveaway item is going to be a $50 gift card to Amazon.com, which is great because you can buy literally anything there. I am really trying to increase my interaction with the readers, thus I’m increasing the possible additional entries that accompany an email subscription to MITR, as well as liking MITR on Facebook! You must comment on a non-giveaway post within the site, and then copy and paste that very same comment in the section below this giveaway post. You will receive 1 entry for your comment, and you can repeat this task 1 time per day. The giveaway will run for 18 days (because I just feel like it), so that will leave you with 18 possible entries should you choose to comment each day. It is possible for each person to receive a total of 18 entries by placing a comment each day, and an additional 27 entries for the optional methods. One person can receive a possible maximum total of 45 entries into the drawing. You must complete all entries prior to 11:59 PM Eastern Time the night of September 19th, 2011. The winner of the giveway will notified by email on September 20th, 2011. The winner will have 3 days to contact me via email/contact form and accept the prize, otherwise there will be a redraw for a new winner.